You need a car emergency kit! You are here: Home / How to Be a prepper / You need a car emergency kit! Do you have a vehicle emergency kit? There are essential items that every vehicle should have on board at all times. Some of them are obvious and some not-so obvious. A good prepper doesn’t wait until something happens before he starts to make a plan. Do you have everything you’ll need when the unexpected strikes? Do you have someone in your family that drives but might not think about things like this? You need to make a list and start putting things together – TODAY! Some of these items should be carried at all times and some should be carried if you go on extended trips. Only you can decide what is best based on your comfort level, the weather, terrain, how long you plan on being away from home and how much room you have in your car. You’ll probably find that you’ll need more than one kit in your car to keep everything in a logical order. This is all in addition to any kind of bugout bag or GHB that you might carry in the vehicle. First and foremost, EVERY car should have a jack, a tire iron or equivalent and a recently-inspected spare. Spare tires go flat without notice so make sure you remove the tire and set it on the ground to make sure it still holds air. If your car has custom rims that have a special key, make sure you keep that key somewhere you can find it or your tire iron will be useless. You don’t want to keep it where potential thieves can easily find it, however, or your precious tires will be on their car. Keep emergency contact information in the car. You should have something in the vehicle that will tell first-responders who they should call if you are incapacitated. You should also keep contact information handy for yourself in case something comes up and you lose your phone. This information should be kept with you and not your vehicle when you are not driving. It should be in your emergency kit. Make sure you have at least two good flashlights in your vehicle. If you run into trouble and need to change a tire or fix something under the hood, it is a lot easier to do if you can see. Battery-powered lights are very portable and do not require a good car battery but they run out quicker and don’t shed as much light. Lights that can be plugged into your lighter or clipped to your battery will usually last much longer and are usually brighter but they obviously require a good car battery. At least one of each would be a smart move. Make sure you have extra sets of proper clothing items. Gloves are very useful when working on a vehicle and can be used if the weather turns cold. During colder weather, your requirements expand. A scarf or a neck gator will take up little room in your vehicle but may keep you warm if you have to walk to get help during cold weather. A foldable emergency rain jacket is also good for this. If you have room, you should keep some kind of sweater or light jacket during the colder months. Always keep some kind of bottled water in your vehicle. You may not only need it to cool your radiator, you may end up on the side of the road for extended periods of time and dehydration can kill you. Just make sure you never open a hot radiator if you decide to fill it. If you have the room, an empty gas can will save time if you run out of gas. Some locations may not have them available for sale when you need them. Do not store gasoline in your vehicle in any location other than your gas tank. Antifreeze is very handy if you have the room but water will suffice for short distances. Keeping the heater on and air conditioner off will help cool your engine if it is overheating. Some kind of First Aid Kit should always be available so if you don’t always have a bugout bag that has one, you need to put something in your car. There are many different types of kits available and many different items that could go in them. What goes in this kit could easily be an article in itself. 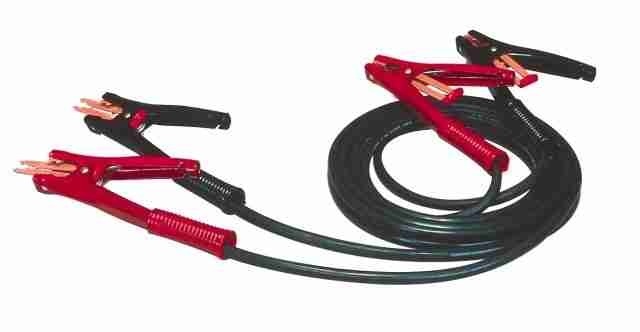 Keep a good set of jumper cables in the vehicle or even better, a jump box that has a charged battery inside. Cheap cables will have a smaller gauge wire and flimsy connectors. They will not jump your vehicle sometimes when a better set will. The jump box has shorter cables and will usually start a vehicle better than jumper cables. If you’re going to skimp on anything, don’t make it your cables. Longer cables mean less power goes to your battery but they’re useless if they don’t reach. The thicker the cable, the less resistance it has to the current. Keep at least a quart of oil in your car at all times. An old blanket can come in handy for lying on the ground while you work or keeping you warm. Moving blankets are also useful for this. Keep a few rags or a roll of paper towels in the vehicle for wiping your hands after working under the hood or with liquids. I keep one under my hood and one with my tools. Always have an ice scraper if you are coming up to cold-weather season or traveling to higher altitudes. Flares or some other kind of signalling light would be a good idea to use to make sure people know your car is on the side of the road and in trouble. You never know if you might break down during fog or at night. If you don’t have a Ham Radio in your vehicle, you should get one. You’ll need a license but they’re not that hard to get. I use a Yaesu FT-857D Amateur Radio Transceiver but you may want to see what will work better for you. A hand held is better than nothing but won’t have the range of the portables. Get a good waterproof one if you decide to go that route but there should already be one in your go bag. This list should be enough to get you started but I bet you can find other items that you feel should be kept in the vehicle. The point is that you should be thinking of these things and doing something about it, either for your car or for someone you care about. A small decision like keeping your car with necessary items can have a big effect on someone’s life – including your own. I would probably also add a spare set of fuses, bulbs and sparks + HT leads to the emergency kit as they don’t take up much room or budget but can cover a lot of issues that would make driving non-viable otherwise. Serpentine belt is a good addition too. Had one let go at supermarket. Be sure to have what tools are needed to release the tensioner arm too. The CB radio is something I didn’t think of. Mine is stored in the garage, I might just install it in the car this weekend! These are great but you need a tire plug kit, fix a flat and know how to use both. Maybe just maybe an extra spare if you travel in remote areas. I was recently stuck when I ran over something and got two flats and had only one spare.